In this lesson, students are introduced to the concept of Thanksgiving, make a Thanksgiving turkey decoration, sing a Thanksgiving song, read a funny Thanksgiving story and play lots of fun games. Members get accompanying worksheets, song and classroom reader. Structures: "Happy Thanksgiving! ", "How are you? ", "Hip hip hooray!". Target Vocab: Thanksgiving, turkey, gobble, wobble, cold, colder, warm, warmer, hot. This lesson plan does not focus on the history of the American Thanksgiving festival as it would be too complex for younger learners and in many cases has little relevance within their own culture. Instead, it introduces students to the main things that happen at Thanksgiving - family gatherings for dinner, giving thanks and most important of all, the Thanksgiving turkey. This lesson will introduce some good vocabulary and provide lots of fun activities! Start the lesson as you usually would (E.g. Hello song, "What's your name? ", "How are you? ", homework check, etc.). See our "Warm Up & Wrap Up" page for further ideas. Before class print out the family Thanksgiving dinner picture - either blow it up as large as you can or print off copies for groups of your students to share (you can see a small version of it below but we have the full-sized version in our Member's Area). for very young / low levels: ask how many people there are and what colors they can see. for other levels: ask the above questions and also ask what clothes different people are wearing and get students to speculate about the food and what is happening. Finally, explain / elicit that they are a family in America having a dinner of thanks. You can explain some food (e.g. mashed potatoes, pumpkin pie, etc.) but focus on teaching the word "turkey". NOTE: students may or may not know what a turkey is. Show our flashcard picture of a turkey but if you can show photos / videos of turkeys so students understand (and point out that a turkey is not a chicken). For higher levels, you can have a class discussion on giving thanks - first give some examples of things you can give thanks for (food, good health, family, friends, etc.) and then get your students to come up with ideas they are thankful for - any answers should be accepted, however strange (e.g. thankful for their Gameboys, etc.). 2. Play " Thanksgiving Picture Quiz"
Take the picture away and say you are going to have a quiz on this picture. Put students in teams and get each team to come up with a name - write the team names on the board. 3. Make a "Turkey Hand & Foot Decoration"
Take out your pre-made turkey craft decoration and ask the class what it is (elicit "turkey"). Ask what shape the body and wings are and try and elicit that they are the shapes of your hands and feet (you can show this by placing your hand over one of the hand cut-outs). 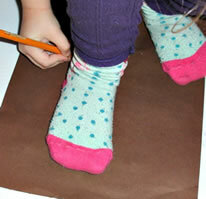 i)	Using brown construction paper, students help each other to draw an outline of their foot. This is then cut out (help younger kids with the cutting). 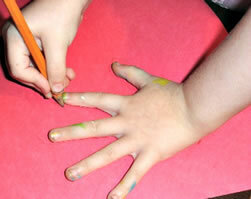 ii)	Now pairs help each other to draw outlines of their hands on yellow and orange construction paper. Again, these need to be cut out. iii)	Finally, get the students to cut out little feet and beaks from the construction paper and glue everything to the body. Eyes can either be drawn on or if you have craft eyes you can stick them on. 4. Play "Hunt the Turkey"
Once the student has found the turkey and everyone understands the game have the student pairs play together. Each time they finish they can change roles. Monitor each pair and help out with the vocab (warm, cold, etc.). 5. Sing "The Thanksgiving Song"
Ask everyone what noise a turkey makes. Teach them the turnkey noise and action (strut around, flapping your elbows making "gobble gobble" sounds). Get everyone to join in. Now play the song and have everyone watch you and join in with the actions (download MP3 song at the end of this page). Encourage everyone to sing along - it's a very simple song but great fun! Play the song 2 or three times. Lyrics for "The Thanksgiving Song"
gobble, gobble, gobble, gobble, gobble"
wobble, wobble, wobble, wobble, wobble"
With a "Gobble, gobble, gobble, gobble, gobble"
And a "Wobble, wobble, wobble, wobble, wobble"
"Gobble, gobble, gobble, gobble, gobble"
"Wobble, wobble, wobble, wobble, wobble"
Gestures for "The Thanksgiving Song"
"Hello Mr. Turkey, Hello Mr. Turkey" – everyone sings and waves. "How are you? How are you? " – do the question gesture (palms up with inquisitive face). "With a gobble … And a wobble…" – this is the really fun bit. Everyone runs around like a turkey (crouched over, flapping elbows in a wobbly fashion) while gobbling! "Happy, Happy Thanksgiving" – stop running around and sing. "Hip hip hooray! " – throw arms up in the air in celebration! 6. Read classroom reader "The Thanksgiving Turkey"
Teacher: (pointing at the turkey picture on page 2) What is Mr. Turkey doing? Teacher: That's right, he's eating his food. (Reading) "I’m thankful for my lovely food each day." For younger students, elicit some of the objects and colors in the pictures and have fun with the story. Teacher: (pointing at the turkey picture on page 5) What is Mr. Turkey doing? Teacher: That's right, and where is he? Teacher: Yes, he is! And do you think he's thankful for his home? Teacher: Why do you think so, Ema? Ema: Because it is nice. Teacher: Yes, it is very nice isn't it? Let's see (reading) "I'm thankful for my cozy home." Are you thankful for your home, David? David: Because it is warm and comfortable. After reading the story, give out a reader worksheet to each student and have everyone fill in the blanks. Then read through the story one more time (without stopping for questions, etc.) to check the answers as a class. At the end, ask students what they are most thankful for. This can lead to a great discussion. Make sure there are the same number of footprints as the number of students in the class. Start playing some music - either the Thanksgiving Song or any other music. 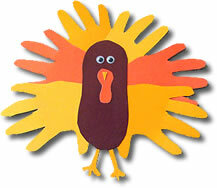 Let the students pretend to be turkeys and strut around the room (gobbling and wobbling). When you stop the music, have the turkeys find a footprint to stand on (one turkey to a footprint). Now, remove one footprint. When you start the music again, have the turkeys continue strutting around the room and when you stop the music everyone needs to find a footprint to stand on - the one student who can't find a footprint is out. Remove another footprint and play the music again. Keep playing until there is just one student left. 1. Assign Homework: We have three worksheets to use depending on the age and level of your students. For the very young: "Color Turkey"
For lower levels: "Turkey Escape"
For older / higher levels: "Thanksgiving - Thank you for ..."
2. Do your usual end of class routine (tidy up, put away things in their bags, sing "Goodbye song", etc). For further ideas see our "Warm Up & Wrap Up" page. 3. As each student goes to the door to leave the classroom ask them to show you how a turkey walks. Good impressions can leave the room (alternatively, for older students ask them to tell you something they are thankful for).